Sleep apnea can greatly impact an individual’s ability to function and can disrupt their ability to achieve a full night’s rest. If left untreated, the side effects of this breathing condition can quickly snowball, putting patients at risk of serious complications such as heart disease, stroke, and high blood pressure. Early identification is crucial to alleviating the symptoms of the condition and protecting patient’s health. At New Age Dentistry, Albuquerque Dentist Dr. Kapil Grewal collaborates with local sleep doctors and other specialists to create comprehensive and effective treatments that thoroughly address the cause and symptoms of sleep apnea. This overnight breathing condition occurs when airflow is obstructed by the collapse of the soft tissue at the back of the throat, as seen in obstructive sleep apnea cases, or by the failure of the brain to signal proper breathing, as occurs in cases of central sleep apnea. Regardless of the cause, cessation of breathing causes the patient to awaken abruptly in order to breathe. The result is fragmented, frequently disrupted sleep which can lead to persistent daytime fatigue, headaches and migraines, mood changes, and depression. Sleep apnea can also cause loud snoring, which indicates airflow obstruction. Often, it is patients’ partners that recognize the nighttime cessation of breathing or characteristic snoring as symptoms of sleep apnea. As patients are often unaware of their overnight breathing habits, many cases of sleep apnea go undiagnosed. However, certain indicators such as bruxism are indicators to dentists that a more serious issue may be at hand. At New Age Dentistry, we conduct sleep apnea assessments during each routine examination. If a patient is experiencing serious symptoms of the condition, Dr. Grewal may refer the patient for a more extensive overnight sleep study, conducted at a specialized sleep center. After a patient has been diagnosed with sleep apnea, our Albuquerque dentist works closely with other specialists to determine the most effective solution. Traditionally, CPAP machines have been utilized to alleviate the symptoms of sleep apnea. However, many patients have found oral appliances to be a more comfortable and less invasive solution to sleep apnea. For patients with mild to moderate sleep apnea, or individuals that cannot tolerate CPAP machines, oral appliances are a comfortable and effective alternative. Custom made to precisely fit your dentition, oral appliances move the lower jaw forward, preventing soft tissues and tongue from collapsing into the airway. At New Age Dentistry, Dr. Grewal is a preferred dentist for the TAP 3 Elite and SomnoDent MAS sleep appliance, which allows normal breathing and oral function while being worn. 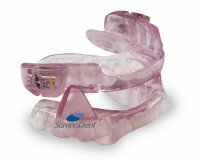 In addition to alleviating the symptoms of sleep apnea, this oral appliance is incredibly convenient, comfortable, and easy to travel with. Our mission is to provide patients with effective care that addresses their dental conditions while improving their overall health. For more information about treating sleep apnea, contact Dr. Grewal today.